The amazing mattress in a box! 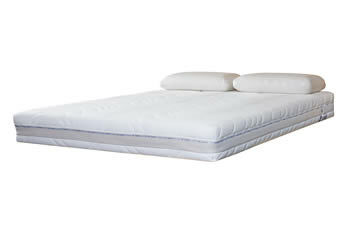 The 624 mattress is a revolutionary mattress that allows you to choose from two levels of firmness, offering a fantastic level of support with comfort to suit everybody. If you prefer a firmer mattress, choose the natural latex side, which quickly responds to the body’s movements and relieves pressure points to keep you comfortable all night long. If you prefer a more cushioned feeling from your mattress, choose the memory foam side, which conforms to your body shape, giving you a feeling of weightlessness. Whichever sleeping side you choose, you’ll benefit from the soft touch removable, washable cover that draws moisture away from the body for a more comfortable night’s sleep. Choose from soft/medium or medium/firm both in the one mattress!